I've been working on a piece analyzing MLB players rumored to be available in trades. We know Cliff Lee is the top prize. Roy Oswalt will be good wherever he is, and then, of course, there's everyone else. I've been at it for about eight days, I think. It was before the Russell Branyan trade, and that feels like several days ago. The problem is that I haven't really written much on the subject. I've simply been listing/ranking the players I've been hearing about. Instead of analytical thoughts surrounding the list I was compiling, I kept jotting down other random, unrelated thoughts. In the spirit of Ewam MacColl, Woody Guthrie, Jack Kerouac, Bob Dylan, Robert Plant, and yes Bill Simmons, we shall ramble on. Because the following thoughts are not all intertwined, we'll separate the mini posts with asterisks and squiggly lines. I'm pretty sure that is lazy writing, but if I know anything about human nature in the Summer of 2010, it's that most people have been conditioned to be lazy readers. Whomever wants to read distinctive writing, with rich descriptions, lucid stories, and unmistakable quality of detail, may I suggest delving into some Gabriel Garcia Marquez, William Faulkner, or Miguel Cervantes. It's been happening every year since he left Texas. There's always a dose of desperation. Although Mark Teixeira just turned 30 this April, and he's averaged 5.4 Wins Above Replacement since his rookie season in 2003, people are quick to say he's through. "He's finished!" "He may never get out of his current slump." Maybe that last one was an exaggeration, but there really is a sense of panic when you read obnoxious columnists criticize Brian Cashman or hear diehard fans forlornly cry on sports talk radio. 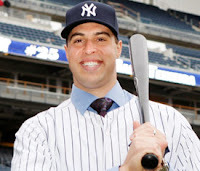 Should we agree that Mark Teixeira is a slow starter and extremely strong finisher? I think the reactions are mostly a byproduct of overvaluing Batting Average. 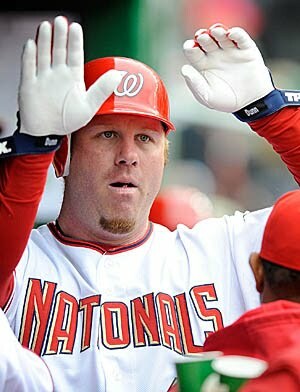 His career Avg in April is .237 (in 744 career plate appearances). Throughout his career in August he's hit .311, and in Sept/Oct .313. His Homerun numbers? 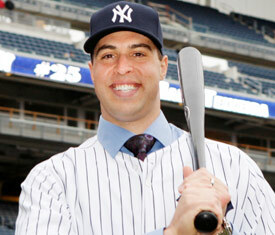 In the 1st Half, throughout his career, Teixeira has hit a homerun once every 21.7 plate appearances. In the 2nd Half, the frequency increases to once every 17.4 PA's. Over a 700 Plate Appearance season, that difference in frequency is the difference between hitting 32 HR's and 40 HR's in a season. 32 HR's is not too shabby. They could be rent-a-players, with impending free agency or team options. Or, they could be under team control for years to come. What we are discussing is who are the best players that we've heard are, or may become, available? This doesn't include valuable prospects that could presumably be used to acquire guys on this list. In other words, we're not considering prospects like Logan Morrison, Jennry Mejia, Wilson Ramos, or Jose Iglesias. Cliff Lee: Comparables could be 1984 Rick Sutcliffe, 1985 David Cone, 1998 Randy Johnson, 2008 C.C. Sabathia, or heck even 2009 Cliff Lee. He's been incredible so far this season. Corey Hart - the drop off begins here. I guess there's sort of a big 4 of available trade targets. Adam Dunn is the last A-Lister that I think could get moved this month. Then again, I don't know anything. Plus, who is "available" could change any moment. Brett Cecil - he's probably not very available, but if the Jays get a little nutty, teams should pounce. David DeJesus - Double DJ has always been a better real life player than roto player, and we appreciate his attributes. We feel the rest of his season could go either way because moving to a contender could really help him blossom as a player. Or, he could be playing way over his head and looking down the barrel of an upcoming slump. Ben Sheets - Matthew Berry likes to say something like, "with this guy, you either believe or you don't." With Ben Sheets, I still believe. The only reason he's behind Haren is because I don't want the limb I'm standing on to completely break. I think Edwin Jackson's arm is running out of bullets. Big Z can still win games, but he's a psycho who makes BANK. Ben Sheets is coming back from a tough injury and will continue to improve. I hope. Jeremy Guthrie - It'll be interesting to see if the Oriole's will move Guthrie. I think he's more valuable than Millwood, due to youth, salary, team control, etc. For all those reasons, however, it'll be much easier to get Millwood. Jose Guillen - contract year, 2nd half! Russell Branyan - I'm thinking the M's will trade him again after the Cliff Lee deal. Brett Myers - It's a big win for Houston if they can get something to help in the future, for risking the money to sign Myers last winter. 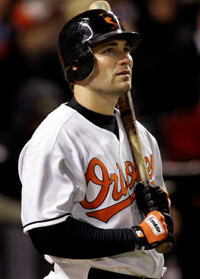 Luke Scott - He just hit the DL on a strange injury, but when he comes back he'll still have lots and lots of power. Austin Kearns - fastball masher who could really succeed with the better-than-ever lineup protection/baserunners. 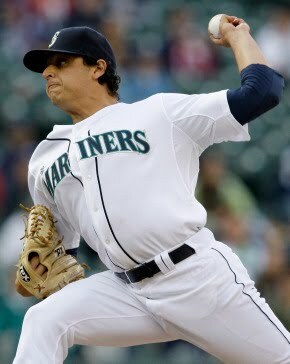 Who is this Jason Vargas? 27-year old Jason Vargas was kind of a throw-in of the Franklin Gutierrez, Aaron Heilman, J.J. Putz 3-way deal between the Indians, Mets, and Mariners. He was a free agent this past offseason, only signed for $412,500, and is having a very nice season. 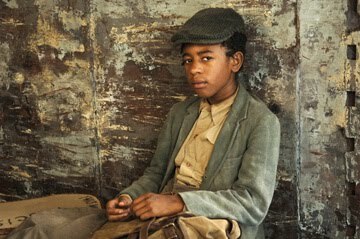 He's young enough to be good for a few more years, but I think this is it. If it's true that most players peak is actually 24 to 28 years old, then we can expect that Vargas' stock will bever be hire. The Mariners could really take over the AL West for years to come if they can successfully get talent for Cliff Lee and a handful of other guys, like Jason Vargas, on the roster. How could the savvy young executive who established himself in Cleveland, succeeded with Dan O'Dowd in Colorado, ended an 86-year championship drought with Theo Epstein in Boston, and built a Diamondbacks team that reached the NLCS in 2007 get dismissed less than 3 years after signing an eight year extension (8!) securing him through 2015 ?? What is this the NHL? English Premier League? Really, what is going on? Unless the Diamondbacks get Kevin Towers or the next Branch Rickey, it's doubtful they'll be able to justify this move. What looks bad on his record? I guess giving away Scott Hairston for Leo Rosales hasn't worked out at all. 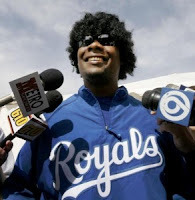 He traded Alberto Callaspo for Billy Buckner who has provided minus -1.7 Wins Above Replacement. Again, that means that during his 104 innings pitched for Arizona he was 1.7 wins worse than the average replacement pitcher they could have gotten from triple-A. 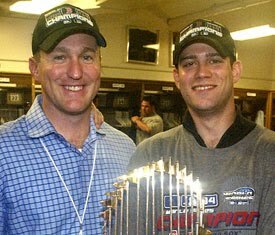 He signed Eric Byrnes to arguably the worst contract in team history, and subsequently trading blocked left fielder Carlos Quentin for Chris Carter. We don't mean NFL Network's Cris Carter, not even the Mets' Chris Carter. This guy has yet to make an apperance in the Show and is hitting .234 for the Sacramento River Cats.